Ok peeps we're back! back in the wired up n wireless world of y'all, back from under the channel, oui mes enfants j'ai le desir de devenir une francaise doucement,lentement..But best of all i now have my new Macbook- which means i am free from my broken-down world to roam comme je veux, and that is all i need! altho now i have to teach myself not to wipe my whole hard-drive by mistake as i did the other day with my fumbling impatient fingers.. yes a steep curve of learning is being learned..So thank you for the lovely offers of help with elastic bands and 2nd hand washing machines, but i dont need that s*** no more cos i got a mac ok no credit crunch for me!!?? :)AlrightAlright so another two tracks are being mastered at Masterpiece in Fulham London on Wednesday to add on to the 6 trax we already have,and there i think we are going to leave it..and then we are to prepare for a secret live show with our luscious new line-up which will start it all off again.. now Brighton has recovered from the Great Escape crazyness..
We have had another writing spurt for the rest of the album now the EP's done and really tying it up to be finished for June 1st. Meanwhile photos have been done (i'll post some up when i'm back online..) and artwork being developed..so its all good. Gotta go before i'm kicked off my mum's computer. Speak to you Tuesday!! evening all! back to the mastering today as we had to tweak a few things, but Wonderland and its B-side Teardropsfall is done and dusted, since Mark decided at the eleventh hour to add in a whole lot of orchestration (sounds amazing tho..!) And the rest will be in the bag on Monday! But of course you musn't hold your breath (i can hear gasping and spluttering from you all) because after all this is The Mummers which is synonymous with 'nearly done but not quite lets change sum stuff no sod it lets start again'. So well lets just wait till monday eh? 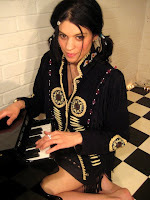 Anyway heres a pic of me practising in the studio with my toy piano which was going on whilst said orchestration was happening ( i never play adult instruments as you know) with my new red-indian jacket i'd just found in the lanes and am very proud of even tho my good friend jess who likes to give me good style advice says it makes me look like a sack of potatoes with a pin-head on top. Nice! Thanks! As you can see i've overdone the blusher on this occasion but never mind, at least it covers up my "sallow skin" as my mother always told me..
Hope you're all good, i think i am..
Salut! Had a good rehearsal just the three of us today with Paul trying out new guitar sounds and Mark playin 3 keyboards at once (dont ask me how) these being the rhodes + space echo, the moog (wikid analoguey sounds), and the old classic Korg M1 (which was the first keyboard i discovered how to write music on..) And me on Glocks! We're preparing for tomorrow's full band rehearsal with our new line-up which includes Pete davison and Charlie buchanan on trumpets, and Tessa Gilles and Maddy Rix on violins. we are trying to play EVERYTHING live this time and therein lies the challenge! Then we has a meeting with a friend of ours who may make a short film of Wonderland, and then we had a meeting with the manager who gave us all smacked bums for being so slow finishing our album.. but art is art we cried, and cannot be rushed! Its 11pm on sat night..
.. and i just got in from Brighton. Have spent every day in the studio for weeks and now i keep forgetting what day it is, i haven't seen the news, i havent had a meal that isn't sandwiches for longer than i can think, and everyone back home has forgotten who i am. But I'm sure its going to be worth it because our album the first is very nearly finished! We've been doing loads of last-minute recording of our live players - a totally amazing new trumpet solo on the end of 'Nightbus' and 'Lorca' - his name is Pete Davison everybody and he is awesome, as is our Joe Giddey on cellos... Only two things to do tomorrow - vocal production on 'Nightbus' and revisiting a mix of 'Somebody Said' and then hey presto off to the mastering suite it is! Well just upstairs really because our trusty Edz who does alot of our sound is going to be doing it as he has the full gear in his control room. So anyone who was wondering what happened to our EP that we were working on last year.. well its turned into this mini-album because we just couldn't decide what tracks to leave off but this way we can have just what we want on there so thats much better! On the live side we've been ripping everything apart and have now Pete on trumpet for the next few gigs which is soo coool, and trying to refine everything a bit so it might sound a little different to you if you've been to the others.. but in a good way i hope! Love to you all, i gotta go and do something else and check out the trains to Brighton tomorrow cos i've heard theres going to be a BIG STORM tomorrow so you know what that means - the whole of England will come to a stand-still..
And.. thanks all who came to the water rats on tues, nice to see new myspacers there.. Sorry but this isnt really about music.. but am just noodling away after having turned on the tv whilst putting away a month's load of washing..
Newsnight was on and i found myself tuning into a discussion on climate change and economc 'growth'. Cos for ages I have considered the word 'growth' as a bit of dirty word.. like when the news reports that "consumer spending is up" its like encouraging a foul disease in my high n mighty opinion. But AT LAST HALELLUJIA (how do you spell that?) the big guys are talking about the need to slow growth in the traditional sense to tackle our planet's problems, and instead find a new SUSTAINABLE type of growth which does not necessarily use more energy and resources, just more labour. Obvious init? Back to the good old days?